UPDATE 5PM: Tropical Cyclone Trevor is currently crossing the Far North coast just south of Lockhart River as a strong Category 3 storm. The system involves sustained winds near the centre of 155km/h with gusts to 220km/h. 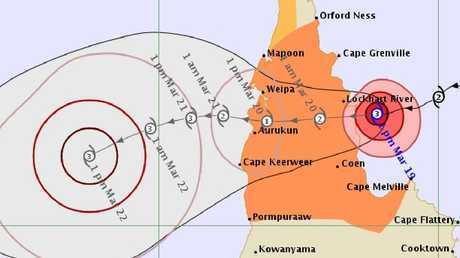 The Bureau of Meteorology says the cyclone will weaken as it crosses the northern Peninsula tonight and Wednesday but is expected to remain a Category 1 cyclone until it enters the Gulf of Carpentaria. "It is expected to reintensify rapidly once it enters the Gulf of Carpentaria and track towards the Northern Territory," the Bureau says. UPDATE 4.15PM: Lockhart River residents have prepared as best they can and are now playing the waiting game as Severe Tropical Cyclone Trevor barrels towards the Cape York coast. The Bureau of Meteorology says the Category 3 cyclone is now "very close" to Lockhart River. Lynn Layton, owner of Greenhoose bush camp accommodation six kilometres out of town, said she and her family had been hard at work since yesterday locking everything down. 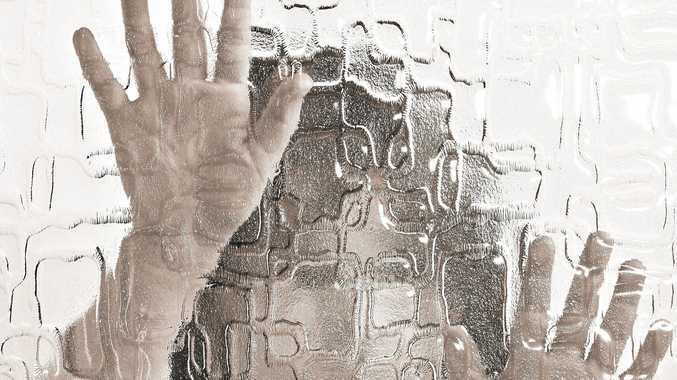 "We've prepared as much as we can, we've put everything away, moved the cars undercover, moved stuff off the verandas, windows have been shut up and everything is as closed and locked up as possible," she said. "I went into town first thing in the morning today to stock up on food, water and fuel; we have enough to last a few days." Ms Layton said others were coming in to buy more supplies from The Freddy Clarence Moses Store as she was leaving. "We've done everything we can, now we just have to watch and wait," she said. ■ All large merchant vessels will be directed to proceed to sea. ■ Naval vessels will be directed by the Base Commander. ■ All port services will be discontinued for the duration of this alert. Forecast track map for Cyclone Trevor, issued by Bureau of Meteorology at 2pm on March 19. UPDATE 2.55PM: St Joseph's Parish School at Weipa will be closed on Wednesday as the community prepares for Cyclone Trevor. A Catholic Education spokeswoman said families would be further advised on Wednesday afternoon whether the school would reopen on Thursday. Lockhart River State School is closed today as the Category 3 cyclone approaches the Far North coast. The system is expected to make landfall south of Lockhart River about 5pm. Residents were earlier this afternoon told to seek shelter, with destructive winds expected from 3pm. UPDATE 2PM: Far North emergency services are warning people across the region to be prepared as the effects of Severe Tropical Cyclone Trevor are expected to be felt all the way down to Cairns. Emergency services crews have been deployed to communities in the cyclone watch zone as the cyclone approaches the Cape York coast. In its 2pm statement, the Bureau of Meteorology warned the very destructive core of the cyclone, with extreme gusts up to 200km/h, will make landfall near Lockhart River later this afternoon. An emergency alert has been issued for Lockhart River, with the community warned to expect destructive winds from 3pm. Residents are told to warn others and seek shelter now. Police sirens will sound for residents to seek immediate shelter. Cyclone Trevor is approaching the coast as a Category 3 storm however the Bureau has advised there is a chance it could reach Category 4 strength before making landfall late this afternoon. Queensland Fire and Emergency Services Assistant Commissioner John Bolger said QFES crews and swiftwater rescue technicians had been dispatched to Lockhart River and Cooktown, with further teams on standby for deployment in Cairns and Port Douglas. "Although we've brought up swiftwater rescue technicians and we have a helicopter on standby, my dream would be to send those guys home dry," he said. "We certainly don't want to have to perform any rescues, so we implore people: if it's flooded, forget it." Fourteen Cairns police officers have also been deployed to Cape communities to assist local councils. Far North district chief superintendent Brian Huxley urged people to be careful in the aftermath of the storm, citing flooded roads and fallen powerlines as potential risks across the region. "Every year people get themselves in strife crossing flooded creeks or roads where you can't see what's under it," he said. Torres and Cape Hospital and Health Service executive director of nursing and midwifery Kim Veiwasenavanua said community hospitals were taking precautions to ensure they would be able to treat patients in the event of power loss or road closures. "At this point in time we have safe staffing levels in Lockhart River, Coen and Aurukun," she said. "We have remote control generators that will switch on at 3pm today to ensure we have safe power levels. "We encourage the people in communities to contract triple-0 if you require any emergency services." UPDATE 11.15am: Severe Tropical Cyclone Trevor could intensify to a Category 4 system before making landfall near Lockhart River late this afternoon or early tonight. The system, which is currently a Category 3, is starting to impact the Far North coast, the Bureau of Meteorology advises. 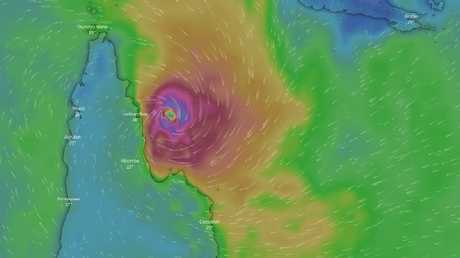 "Severe Tropical Cyclone Trevor continues move west-southwest towards the eastern Cape York Peninsula coast," the Bureau says. "The cyclone will most likely cross as a high-end Category 3 system, but further intensification to Category 4 cannot be ruled out." Tropical Cyclone Trevor will weaken as it crosses the northern Peninsula tonight and Wednesday, but may remain a Category 1 cyclone until it enters the Gulf of Carpentaria later on Wednesday. Forecast track map for Cyclone Trevor, issued by the Bureau of Meteorology at 11.08am on March 19. "It is expected to reintensify rapidly in the Gulf." Gales, with gusts in excess of 90 km/h, are expected in coastal areas between Orford Ness and Cape Melville today as the cyclone approaches. These gales are expected to extend inland over the Peninsula tonight and on Wednesday as the cyclone moves inland. Destructive winds, with gusts in excess of 125 km/h are expected between Cape Grenville and Coen from this afternoon as the cyclone nears the coast. As the cyclone crosses the coast, a storm tide is expected between Lockhart River and Cape Melville, including Princess Charlotte Bay. EARLIER: Lockhart River could be hit with a deluge of up to 300mm today as the small town sits "in the firing line" of Tropical Cyclone Trevor. Gale wind warnings are currently in place north of Cairns for Cooktown coast, and flood watch is in place for catchments north of Cairns. 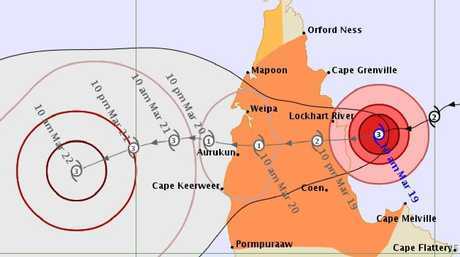 The latest update from the Bureau of Meteorology shows that severe Tropical Cyclone Trevor continues to intensify and move slowly towards the Lockhart River area. "Lockhart River is really the one in the firing line today, they could see 150-300mm with the cyclone crossing today," forecaster Annabelle Ford said. "And similar for Weipa tomorrow, possibly even more. "Cooktown's got possible heavy falls today and the next three days … 70-100mm of rain is expected, more than that with storms. "It'll be similar tomorrow and even heavier on Thursday." The significant rainfall has prompted a flood warning. Cairns is also in for a wet day, with more than 100mm of rain expected. "There's a few places around Cairns that have already had upwards of 100mm since 9am yesterday," Ms Ford said. "(Showers are) set to continue through today, as there's a chance of a thunderstorm as well. "That's really the same pattern for the next few days … particularly towards the end of the week, Thursday/Friday we have possible heavy falls with those showers and storms as well." 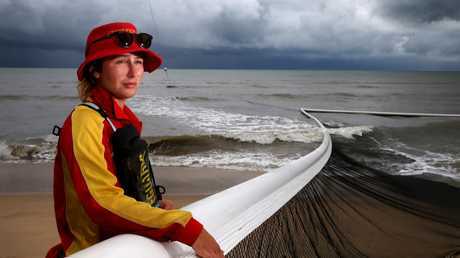 Ms Ford said Cairns could expect to see some relief from the wet weather tomorrow before ramping up again on Thursday. "We've got 20-30mm on the forecaster (for tomorrow), but it could be higher with storms," she said. "But particularly Thursday and Friday it's more likely to be heavy rain." The March rainfall record for Cairns is 1127mm, with the average monthly rainfall about 400mm. Ergon Energy Far North Area Manager Charlie Casa said Ergon was monitoring the severe weather system and urged residents in affected areas to prepare their properties. "We have crews, generation, vehicles and equipment on standby in strategic locations..," he said. "While remote communities may not be accessible by road in the wet season, as soon as we have clear access and it is safe to fly and land in the community, our crews will be there to support you," he said. "Recent cyclones and floods would have signalled the need for residents to clean up their backyards, get their house in order and re-stock their storm kits - the more prepared you are the better. "Even when the weather eases and it is safe to head outdoors, there's a real risk of fallen powerlines so please take care and stay line aware." EARLIER: SEVERE Tropical Cyclone Trevor has intensified to Category 3, expected to make landfall on the Cape York Peninsula south of the Lockhart River about 7pm today. The system is moving towards the Eastern Cape York Peninsula coast, and will continue moving in a west-southwest direction. Cyclone Trevor is expected to deposit large amounts of rain and bring destructive winds in an area from Cairns northwards. Parts of the Far North have already copped more than 100mm of rain since 9am yesterday and a king tide at 8.14am in Cairns today is expected to increase the chance of flooding in low-level tidal areas. Cairns Regional Council advises residents to avoid parking in low-lying tidal areas and never drive through floodwaters. Abnormally high tides are also expected this morning and tomorrow for coastal areas north of Port Douglas. "The current forecast is for destructive wind gusts above 125km/h near the centre of the system," Sky News Weather channel meteorologist Rob Sharpe told news.com.au. "It will bring heavy rain, gales, abnormally high tides and large waves to the Cape York Peninsula." Mr Sharpe said Cooktown could be hit with heavy rain, in excess of 300mm, with flash flooding also likely this week. "In Cairns, rain, showers and storms will be heavy at times this week, with a weekly total most likely between 200-400mm," he said. People between Orford Ness and Cape Flattery (including Lockhart River and Coen), and between Mapoon and Pormpuraaw (including Weipa) and intervening inland areas, should immediately commence or continue preparations, especially securing boats and property, using available daylight hours. 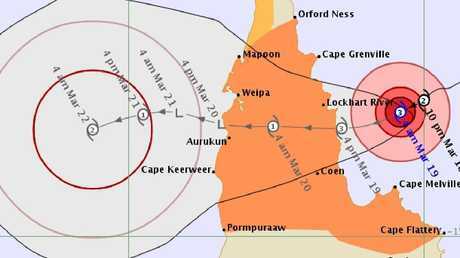 People between Cape York and Mapoon on the northwestern Peninsula should consider what action they will need to take if the cyclone threat increases. The regional harbour master has issued a Yellow Alert for the ports of Weipa and Amrun, with vessel operators urged to take all necessary precautions. A Yellow Alert for the ports of Cooktown and Cape Flattery has now been cancelled, with normal operations resuming. The Department of Education has released an alert this morning, saying they are working with emergency services and agencies across government, and securing school facilities ahead of the expected strong winds and heavy rainfall. Lockhart River State School advised parents on its Facebook page that it is closed today. The Department urges parents, families and children to not take risks, and be especially cautious around floodwater or swift flowing water.